Ia Ora na, and welcome to our December issue. Topics we have in store for you this month include: An Irish artist on Tetiaroa, a plant as fantastic as it it useful, news on a remarkable gathering of minds, our newest team member, and ARMS - an indispensable tool for monitoring the condition of our reefs. Happy reading! 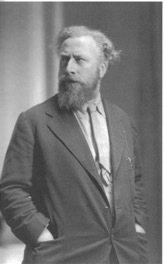 In 1929 an Irish artist named Robert Gibbings arrived in Tahiti and spent his time writing and illustrating his book – Iorana, a Tahitian Journal – the first of many that he would produce. 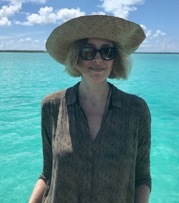 Gibbings' visit to Tetiaroa was the beginning of a life-long fascination with the Pacific islands and their undersea world. 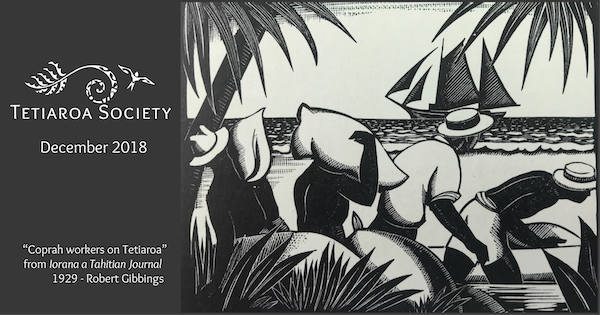 His efforts trying to draw the fish of the Tetiaroa lagoon inspired him to devise a way to draw underwater using a diving helmet and drawing on sheets of xylonite (like celluloid) with sticks of graphite. He stayed the night on Rimatuu; even on this short trip he caught the spirit of the place. Last week, Tetiaroa Society had a visit from Charlotte Wilkins, the great granddaughter of Robert Gibbings. She is a working on a book about her great grandfather’s life. TS was happy to assist her in seeing the place that inspired her great grandfather and in meeting up with the same fish species that he so beautifully illustrated (and are now in our Tetiaroa Fish Guide App!). We look forward to reading the story of this amazing man’s life. 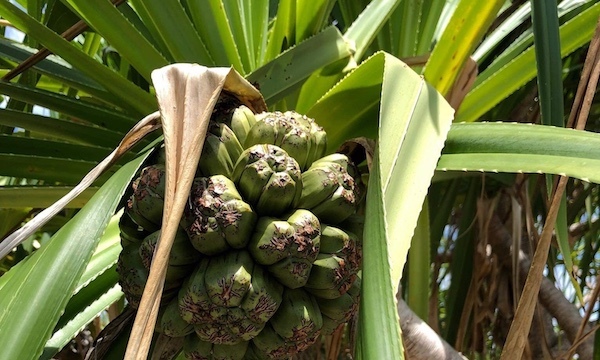 There are many species of Pandanus across Asia and the Pacific, but Pandanus tectorius, is the most common and useful of all of the species in French Polynesia. Pandanus is a monocot and as such the trunk is cylindrical and of equal thickness from the base to the top. It is supported by aerial roots that sprout above ground and form a pyramid under the trunk. The leaves, nested spirally, form a bouquet at the end of the branches. Pandanus is dioecious so there are both male and female plants. The male plants have flowers surrounded by very fragrant white bracts that protect an oval panicle covered with pollen. In Tahitian the flower is called hinano. The flowers of the female plants produce a large segmented oval fruit which, although unrelated, resembles a pineapple. As they mature the segments turn orange-red, separate, and fall to the ground. The most popular use of pandanus however is for weaving. A huge variety of items can be made from the leaves which are long, flexible, and sturdy at the same time. They are used to make baskets, hats, thatched roofs, mats, and during traditional times the sails for voyaging canoes. Pandanus thatched roofs are preferred over those made from coconut palm leaves since they last longer. We are pleased to welcome Virginie Poly to our TS guide team. We became acquainted with her when she first came to Tetiaroa as a volunteer for Te Mana o Te Moana, to participate in monitoring the nesting green sea turtles in 2016-2017. Since then, she has refined her expertise on sea turtles and is now using it in TS. Autonomous Reef Monitoring Structures (ARMS) have become a standard for monitoring biodiversity on coral reefs and other marine environments. There are now almost 2500 deployed worldwide. Last month a team lead by Chris Meyer from the Smithsonian and David Liittschwager from National Geographic were in Tetiaroa to recover ARMS that were deployed on the Tetiaroa reef three years ago. These combined with ARMS from Moorea will allow the researchers to compare the biodiversity of the two sites, one a high island and one an atoll. The ARMS itself is basically a set of stacked tiles that allow small reef creatures to settle and hide. The whole structure is taken up off the reef and brought into the lab, where creatures are identified visually or, if too small then genetically by comparison against the Moorea BIOCODE database. As simple as it seems this is a great tool that gives scientists a view of the reef that is not easy to be seen on human time and size scale. Chris Meyer collecting ARMS on Tetiaroa which contained some fascinating creatures. On the right is a collage of creatures found on Tetiaroa ARMS in 2015. On Nov 2-3 TS and UC Berkeley Gump Research Station hosted the Tetiaroa Holistic Ecosystem Workshop at the Gump Station. It was truly a remarkable gathering of some of the most accomplished rat eradication experts in the world, local scientists, the new UW bird researchers, and a contingent from the Moorea LTER group interested in marine systems. The full report can be read here. After the workshop, a group from Island Conservation were hosted on Tetiaroa for further discussion in the field. As always, our ability to protect and restore Tetiaroa, and carry out innovative science and education programs, depends on your help. Please consider a donation to help us with our mission. 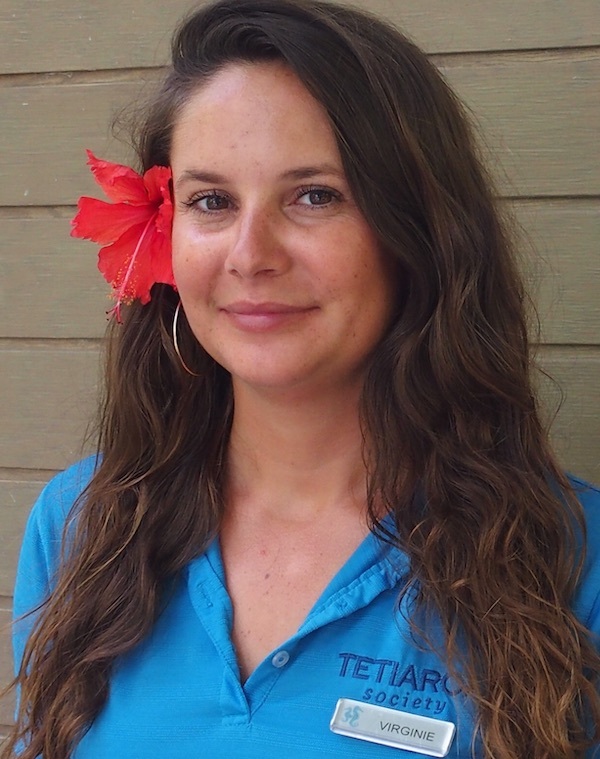 Tetiaroa Society is a US registered 501(c)(3) nonprofit organization (Tax ID #45-1080688). We host scientific research, develop and implement conservation and education programs, and curate the island's knowledge base. We partner with The Brando to establish Tetiaroa as a model for sustainability, where businesses, non-profits, scientists, educators and the local community work together for common goals. Our program objectives are summarized in our Conservation and Sustainable Use Plan, which is available on our website.